ExpoTENtial’s Par Corps Lab – Exercise in the City? Can we build cities that are able to exercise both our bodies and our minds – an experiment in New York reported by [polis] that we would like to see a different version of here in South African Cities, where a large proportion of the cities population walk many kilometers in the early hours of the morning to avoid expensive mini-bus taxi fares in order to get to work on time, while their more affluent co-inhabitants sit in their cars jammed on the freeways…. Can urban intervention create opportunities for fitness in public spaces? Can well-placed “extensions” to existing urban structures, such as scaffolding or bike racks, turn a city into a free gym? Par Corps Lab — led by curator Shonquis Moreno, Robyne Kassen and Sarah Gluck (Urban Movement), and Tucker Viemeister (Rockwell Lab) — investigates these possibilities through a series of physical experiments in the city of New York. 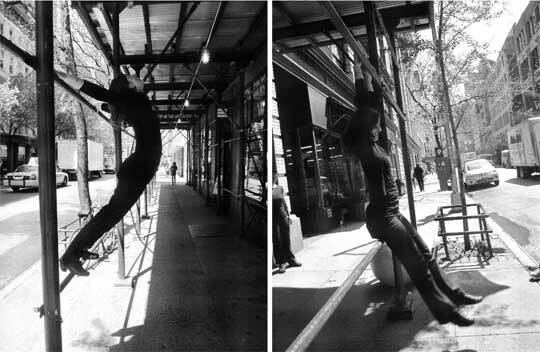 Observations of passers-by, as well as the skill sets of team members (Gluck is also a yoga instructor), led to the concept of cities as exercise machines. As a preliminary research phase, the documented experiments are presented as a film installation designed by Pure+Applied, which will open this evening at theCenter for Architecture‘s Helfand Gallery. Par Corps Lab is one of ten teams participating in ExpoTENtial, an ongoing platform for collaboration and festival based in New York City. The festival opened earlier this month withHug a Worm Lab and Urban Alchemy Lab, each addressing different sustainability-related challenges via interdisciplinary approaches to design practice. The results aim to foster conversation and engagement among urban communities around ideas for a slower, smarter, livelier, and healthier experience in cities. Program director and curator Laetitia Wolff (futureflair) is an active mediator and synthesizer of design and cultural practice. In 2005, her project ValueMeal: Design and (over)Eating, following its second showing at the AIA Center for Architecture, triggered a dialogue with the Department of Health and became a direct inspiration for the Fit City Conference. ExpoTENtial is hosting a fundraiser through Kickstarter to help fund the rest of the labs and continue the conversations on those that have already started. The fundraiser will end on May 31st. ExpoTENtial’s Par Corps Lab opens on Monday, May 16th, at the Center for Architecture. It is on view until May 31st. The Sixth Annual Fit City Conference opens the following day, May 17th, also at the Center for Architecture. Credits: Images from futureflair. Logo design by Pure+Applied.